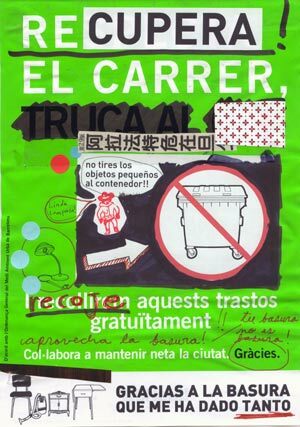 TRASH (bis) is a project that continues with our research on the waste phenomenon in the city of Barcelona, after Trash project and Trash: reuse in your life. 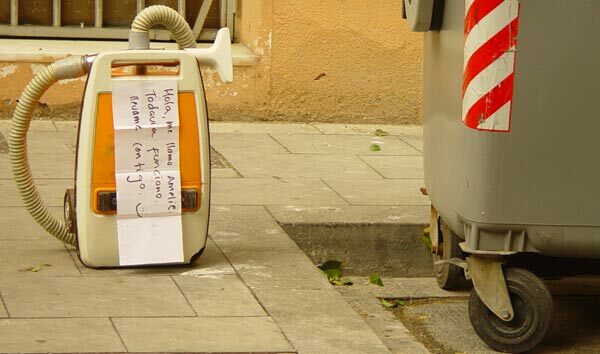 For the last years the city authorities have developed a campaign prohibiting people to leave old furniture on the streets, asking them to make an expensive telophone call, so that some employees from the cleaning company can come and pick them up. this way, that process of recollection an reuse that we are so interested in, tends to desapair. 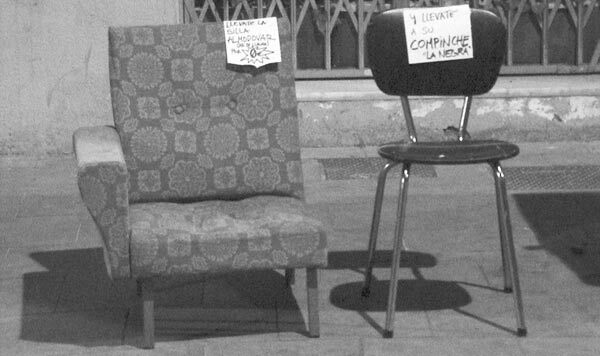 The compulsive consumerism of furniture fomented by multinational corporations that produce cheap furniture by using handworkers in developing countries, in deplorable working conditions, not to talk about their salaries.... makes that on our streets you can find more and more furniture and objects perfectly reusable by the local communities. With this project TRASH (bis): Your trash is not trash, we want to expand the current campaigns on conscious consumption and take them one step further, conscious waste. 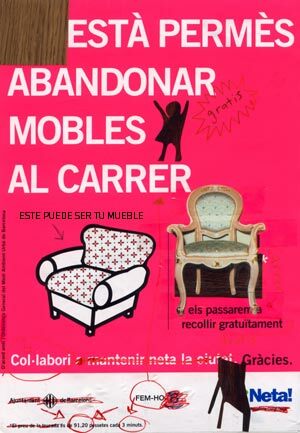 We believe that if you have a chair or something that you don't want anymore, but it works or can be easily repaired, instead of destroying it in the wasting process, it should be treated with care and respect, so that someone else can find it on the streets, take it home and make good use of it. 1. WHEN YOU THROW AWAY A PIECE OF FURNITURE OR AN ELECTRICAL APPLIANCE, PUT A PIECE OF PAPER EXPLAINING IF IT WORKS OR NOT, OR WHAT'S WRONG WITH IT, AND INVITE PEOPLE TO TAKE IT HOME WITH THEM. 2. IF THE PIECE OF FURNITURE HAS DIFFERENT PARTS, PUT THEM ALL TOGETHER. 3. TRY NOT TO RUIN THE PIECE OF FURNITURE WHEN YOU TAKE IT OUT OR YOU DISMANTLE IT. IF YOU THINK IT CAN RAIN, IT WOULD BE GOOD TO COVER IT WITH SOME PLASTIC. 4. IF YOU ARE THROWING AWAY SMALL OBJECTS, DON'T PUT THEM INSIDE THE CONTAINER, THE BEST THING TO DO IS TO PUT THEM ABOUT ONE METER FROM THE CONTAINER SO THEY DON'T GET DIRTY.